Pablo said: "Bacchus is more than a pub, more than a bookshop; Bacchus is a bookshop turned into a pub. And all this just in English! 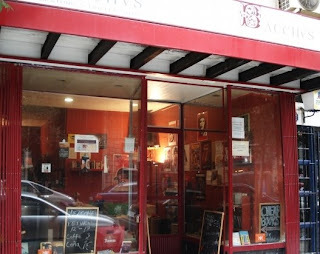 Because there’s the charm of Bacchus, a coffee-bookstore where people from all nationalities come to exchange their own language with English speakers. You can read one of the books that are there -or buy it too-, surf on the Net with its free Wi-fi, play chess or backgammon, drink a beer or a cup of coffee or tea. But you must taste it’s special Bloody Mary cocktail. The best of Madrid without any doubt!" 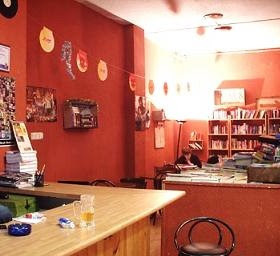 Not so long ago we were recommended a literary bar in Paris (La Belle Hortense) and it seems like the capital of Spain doesn't want to lag behind. The amazing J&J Books and Coffee is already included in our Guide and it also left a very positive impression on us. But that's not it for Madrid. Bacchus Bar and Bookshop is yet another alcoholic friendly bookstore the city has to offer. We were planning to visit this bookstore on the last day of our stay in Madrid but practically everything was closed due to a national holiday, so it has to be filed under our least favorite category - "almost visited". So all we can say from our personal experience is that Bacchus looked like a really interesting spot from the outside. Bacchus is divided into two parts: the books are located downstairs while the booze occupies the upper floor. The stock of the bookstore only contains books in English but we're quite sure they're not that selective about the drinks they offer upstairs. Their stock consists of around 2500 titles both new and second-hand, with the possibility of swapping or selling the used books. It's not comletely gone, just moved. I'm not sure of the adress as I have left Madrid but it's a great place with great people. Visit! Do you buy books in English, or trade...?